3) Angélico, Garza Jr., Jack Evans vs Hijo del Fantasma, Súper Fly, Texano Jr.
5) Fénix, Psycho Clown, Rey Misterio Jr. vs Johnny Mundo, Low-Ki, Pentagón Jr.
That didn’t take long! Thanks to @CarlaDagaGirl. This looks like a temporary poster too, but it’s enough to start selling tickets. Low-Ki (phonetically spelled Law Kid) and ex-WWE-er Brodus Clay look like new additions, but it might just be a one night thing. 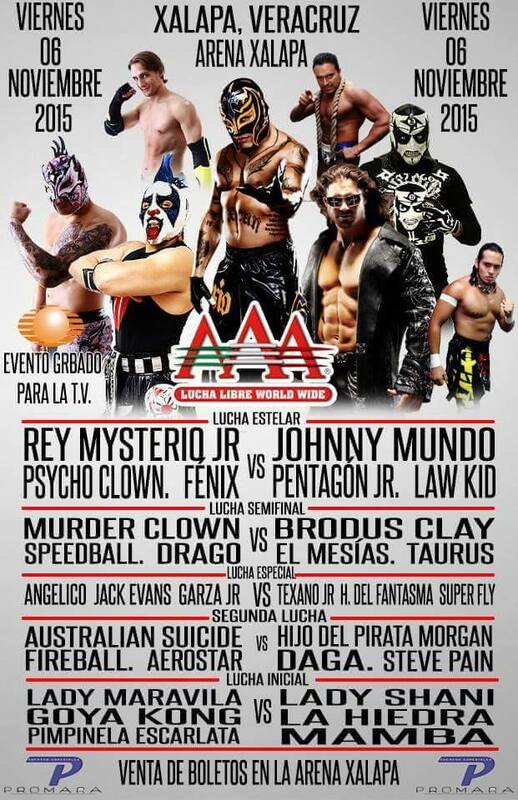 Both (and Mundo) are among the names working the ZZinc show the next day in Veracruz, and AAA might have just been splitting the cost to use them. Clay is theoretically still under contract to TNA and would be needed for their TV shows, if there were any more after this point. Low-Ki was last in AAA in 2006, when the team of AJ Styles, Samoa Joe and Low-ki defeated Crazy Boy, Juvi and Joe Lider in the finals of a tournament. Speedball continues to show up here. AAA hasn’t given him said anything, but Smash Wrestling said Mike Speedball Bailey would miss their next show to start with AAA. Flamita returns as Fireball, facing some of the same guys as his last appearance. It wasn’t mentioned in the results, but Daga attacked Suicide during a backstage interview segment (with Australian Suicide! ), so they’re meant to be feuding. That match doesn’t need a reason to happen because it’ll be awesome on it’s own, but it’s good to give them something to do. Again, tough to tell what they might be going with for Guerra de Titanes, and it now might be different from what they planned when this show was put together. Maybe we’ll get one more taping to figure it out. Interesting that this will be the fourth straight one week taping and eight in nine weeks. They seem to run more taping when they can get local promoters to pay for htem, so all the one week shows means that part of the business is doing much better than it was earlier in the year. The problem is the Peso has lost a lot of value and the foreign talent is bound to be more expensive now than a few months (years) back… Simply put, Dixie’s 400k dollar offer to Alberto carries 30-40% more weight now than when originally rumored, even without adding any actual amount to the alleged deal. And, btw, the Japanese Yen has also lost value… so they should be having trouble paying their gaijin army, so bringing cheap Mexicans for the second or opening match is likely to be very low priority for them.